The short version: this is an absolute classic of a movie, so good that I don’t even mind that a number of the cast are obvious Americans. This is a beautifully-executed amalgamation of various legends of Robin Hood and his band of Merry Men in Sherwood Forest, a story that has evolved greatly over time (and deviated from what scant details are verifiable) but has its roots in genuine tales of a legendary archer who addressed injustices via vigilante violence from at least the 14th century. This version presents the now-standard portrait of Robin of Loxley as a dispossessed Saxon knight forced to become an outlaw when the Normal Prince John, conniving brother of King Richard I, attempts to seize the monarchy and subjugate the Saxons while King Richard is away at the Crusades. Very little of this squares in any way with the actual legend (itself full of disputed details) — it’s off by a mere couple of centuries, a different king and lack of nobility for a start — but who the hell cares. The setting gives us a genuine historical backdrop (Prince John really did overthrow Richard’s regent William Longchamp in an attempt to seize the throne while Richard was held prisoner), a rich and clearly-drawn cast of characters, an injustice for Robin to fight and plenty of pageantry. The 12th century never looked as good as this, and despite all the detail inaccuracy, most people consider this the definitive version of the story which, despite many subsequent attempts, hasn’t been topped (or even equalled). The key to this movie’s enduring success — it’s still very watchable and enjoyable some 72 years after it’s release — has a lot to do with the screenplay, which is beautifully peppered with comedy and drama in perfect proportion to the action, and structured very much along the patterns of Shakespeare’s plots. The casting must also be mentioned, as time has proven most of the choices very wise. Errol Flynn (who was actually born in Australia) gives us a passable attempt at an aristocratic English accent, convincing us he’s a Saxon lord being discriminated against by the treacherous Prince John (just this side of camp portrayal by Claude Rains), the evil Sir Guy of Gisbourne (the flawless Basil Rathbone), and the rather ineffectual and oafish Sherrif of Nottingham (a refreshingly different, Cowardly Lion-esque approach by Melville Cooper). Strangely, however, the Merry Men are appear to mostly be made up of Americans. Excluding Robin and Will Scarlett, the main speaking roles amongst the outlaws are the frog-voiced Friar Tuck (Eugene Pallette, a former silent-movie star who’s distinctive voice made him a comic actor in the talkies) and Little John (father of “Gilligan’s Island” skipper Alan Hale Jr.), the former of which is especially jarring in 12th-century Yorkshire. Still, all is forgiven once the characters are introduced and the action begins, including a number of breath-taking stunts (remembering that there was no technology or safety standards in those days) set against a (California!) backdrop of perfectly gorgeous technicolour, still quite the novelty in 1938 but which has definitely helped preserve interest in this film. Flynn comes off as the perfect heroic archetype; charming, sassy, bold, witty and noble. 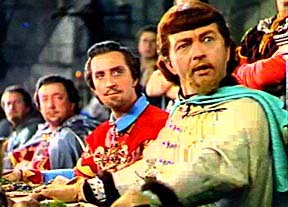 From his first encounter with Sir Guy and particularly in his latter bold appearance in the court of Prince John, his portrayal seems natural and self-assured, like he was born to play it — the fact that his interpretation stands as definitive to this day speaks loudly of how well the script was tailored to Flynn’s personality. Poor Olivia De Havilland has to do all her acting using almost exclusively her eyes for most of the film, only ridding herself of her maiden headdress towards the end, but she proves up to the challenge and gives a surprisingly rich and nuanced performance, even when overshadowed by the much more (shall we say) theatrical stylings of messrs. Rains, Rathbone and Cooper. Sharp-eyed or repeat viewings of the film can yield forth all manner of continuity goofs, embarrassingly rubber clubs and swords, strange plot points (Richard and his men just “show up” in Sherwood with no explanation of how they escaped or got there, right on cue) and so forth, but these sorts of things — which would be excoriated as sloppy in most films — are swept under the rug by the an audience swept away by the pageantry and action. Directors Curtiz and Keighley boldly stage complicated fight scenes and other set pieces with huge numbers of extras and rather complicated shots and by and large it all works stunningly well. Like Captain Blood and other high-adventure films of the period, the filmmakers have no trouble balancing slower, character-rich moments with the fast-paced action, because at all times they remember to be servants to the overall story. The comedy is always delightfully light-hearted, the dramatic moments are credible (particularly thanks to De Havilland, such as the scene in the forest where she begins to be won over to Robin’s cause), and nothing feels out of place — even the entirely-invented romance between the hunter Much and Marion’s nurse Bess. Even the small moments and throwaway lines give the story more variety and depth — careful not to make Robin less than perfectly noble, giving the Merry Men sufficient backstory, avoiding painting the Normans as all-bad or the Saxons as all-good and so on. The Axis of Evil, circa 1166. If you only ever see one Robin Hood film in its entirety, this is the one to see (well, actually, you should watch Mel Brooks’ Robin Hood: Men in Tights right after it). If you only watch one Errol Flynn movie in your life, this is the one to see. If you only watch one colour film from the late 1930s … okay yeah, that would be dumb because there were a number of fabulous colour movies from the late 30s, but this is definitely right up there with Gone With the Wind or The Wizard of Oz. Historical accuracy be damned, this is Hollywood legend-making at its finest and the source of so much influence over not just later Robin Hood movies, but adventure movies in general, that it should be a staple of film schools and periodic revivals, particularly at outdoor film fests. This is genuinely among my all-time favourite films — great historical fun that holds up so well it may well last another century as a beloved fable.